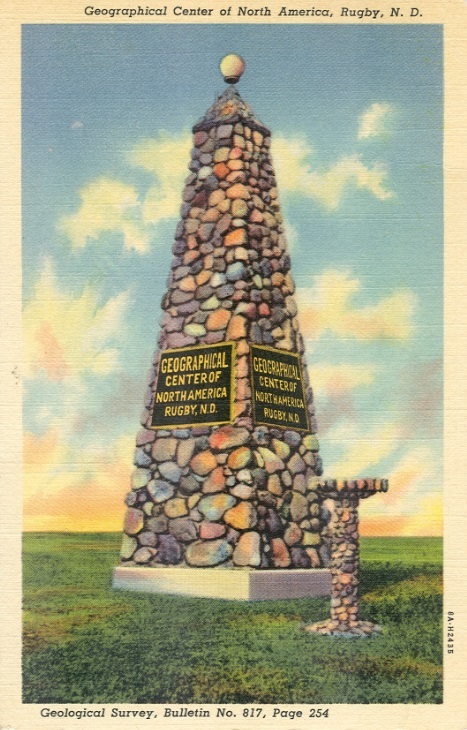 This sign is on all four faces of the monument. 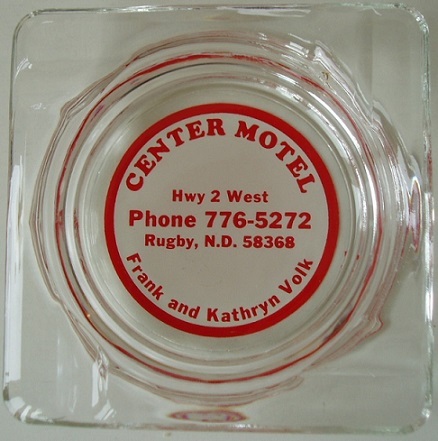 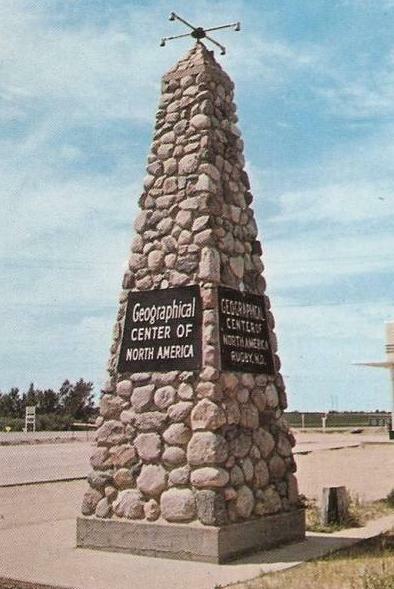 The Geographical Center monument at Rugby, North Dakota, is perhaps the most promoted and recognized of all the geographical centers, yet its origin and location could be considered the most controversial. 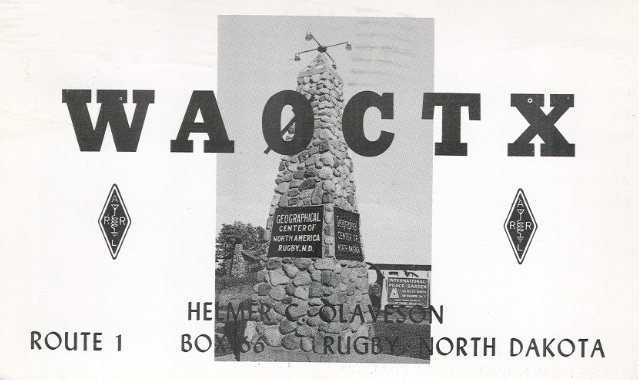 The claim first came in 1927 when the United States Board of Surveys and Maps determined that the position should be located at 48�'N 100�'W. 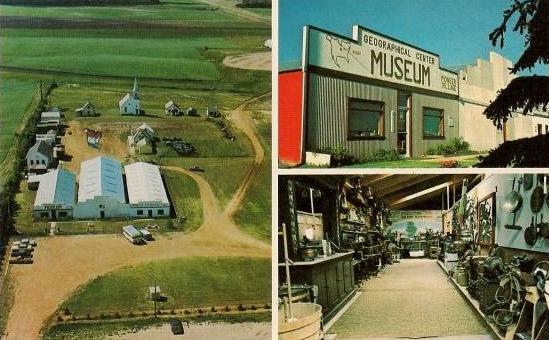 This location was said to be located a few miles west of Devil's Lake, North Dakota. 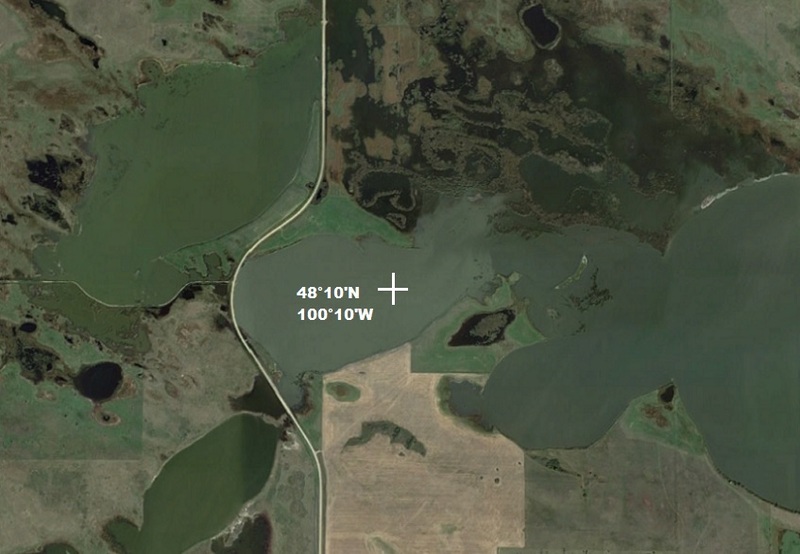 This lake is approximately 40 miles east of Rugby. 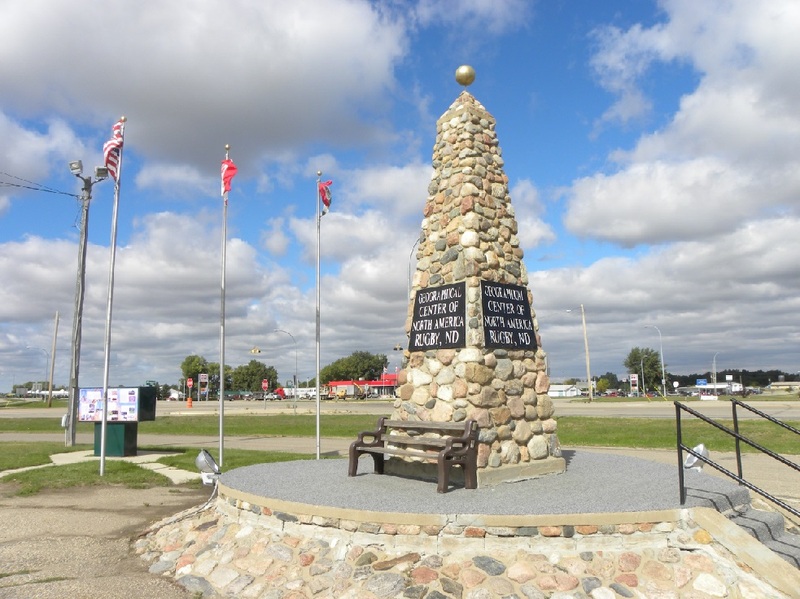 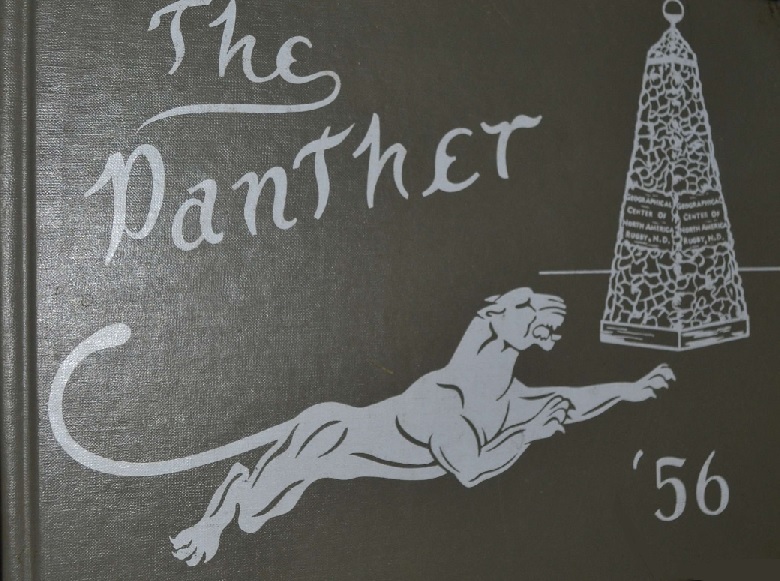 The announcement came as a shock to those in the Pierre, South Dakota, area who had made their own claim more than 20 years earlier and had erected at least two monuments. 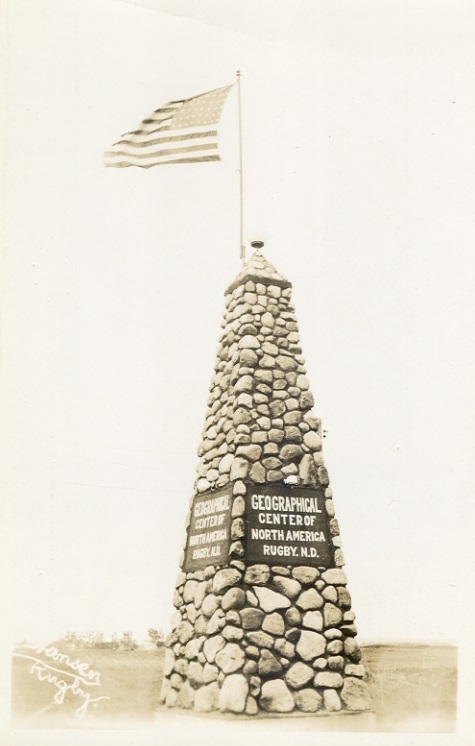 The determination was apparently made by one man, Edward M. Douglas, who worked for the U. S. Geological Survey which was a member of the U. S. Board of Surveys and Maps. 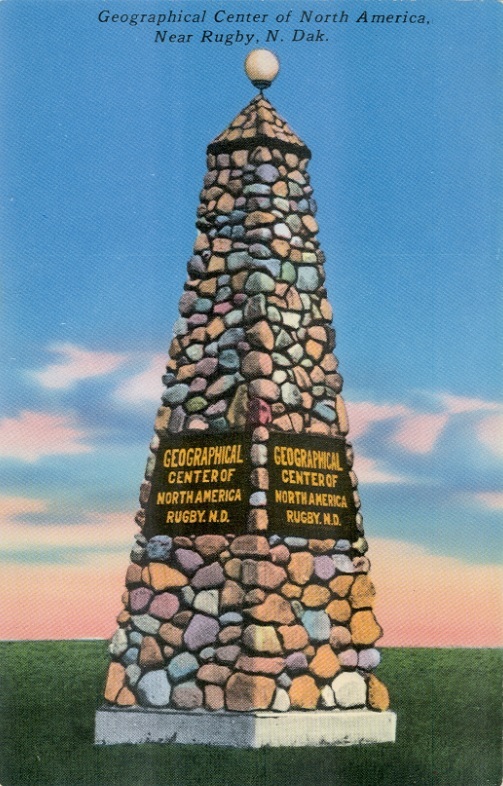 By his own unscientific method, Douglas created a cutout shape of North America and suspended it by cords from various points along the edges with each cord coming upward together to one single point. 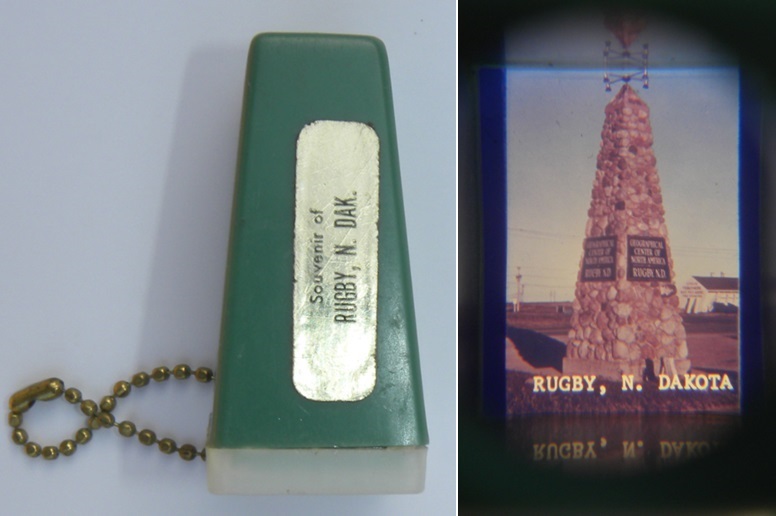 From this point another weighted cord, acting like a plumb bob, was allowed to come straight down upon the cutout map. 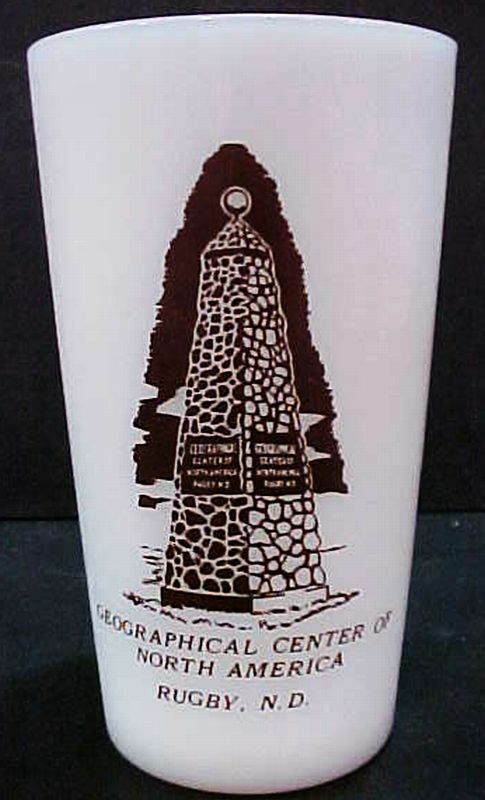 Douglas determined the location was 48�'N 100�'W. 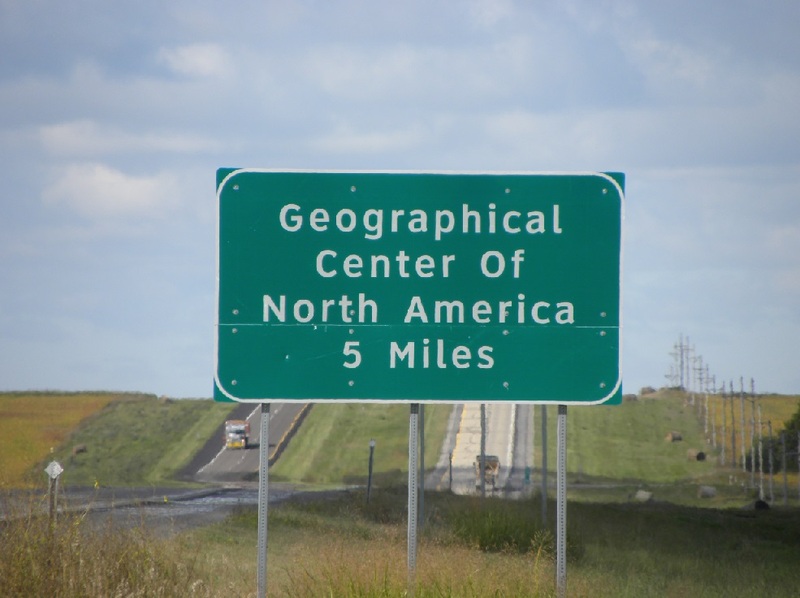 The arrival at this location was never intended to be an accurate or official designation. 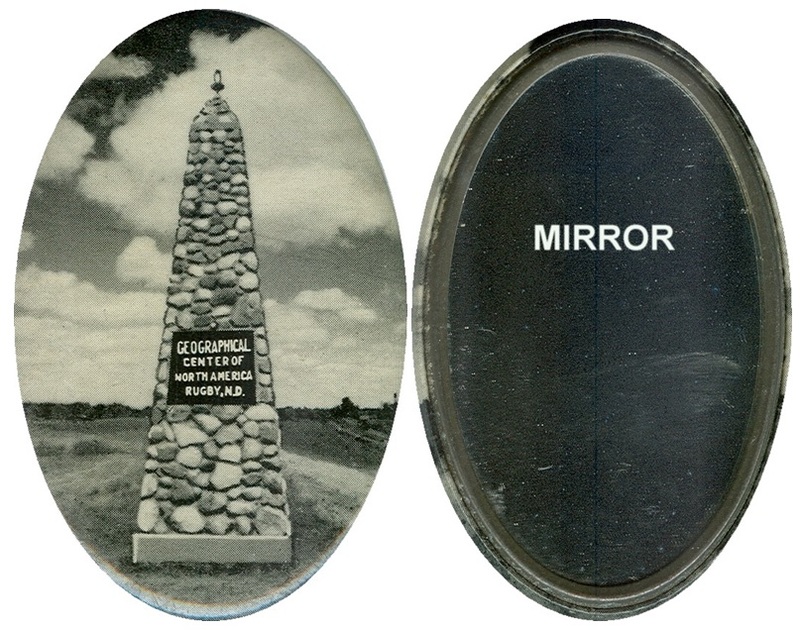 It was, however, published in U. S. Geological Survey Bulletin 817 which was titled Boundaries, Areas, Geographic Centers and Altitudes of the United States and the Several States. 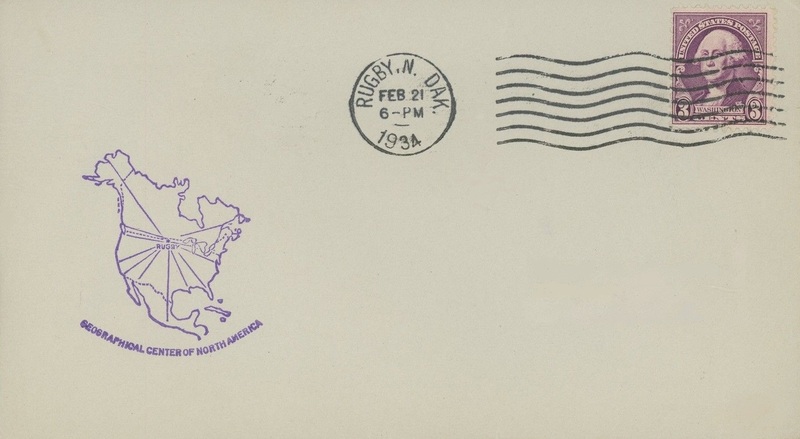 This brief mention, which was actually just a footnote, was enough to seal the location in the minds of many since it was in a government publication. 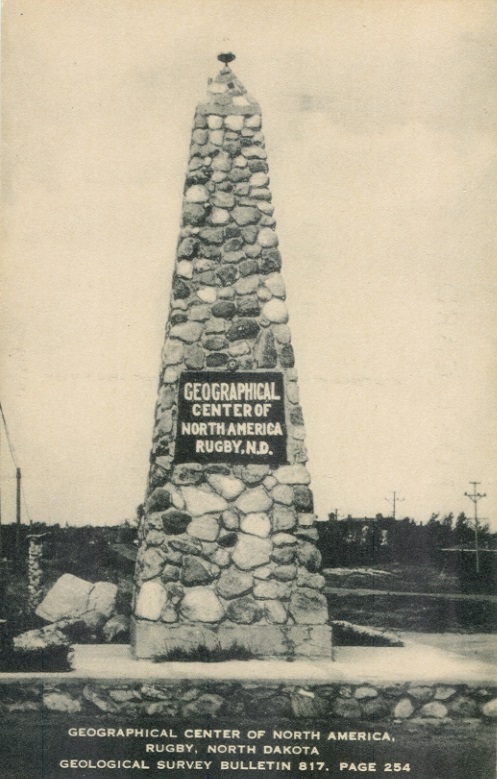 Those at Pierre who had long promoted their city as the Geographical Center of North America, immediately protested and wanted an explanation as to how the determination had been made. 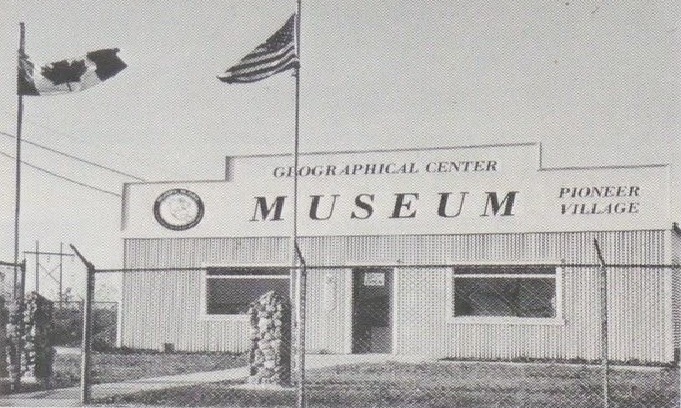 It was revealed that the 74-year-old Douglas was somewhat still loosely employed by the U. S. Geological Survey and may have been more in a director's role at the United States Board of Surveys and Maps of which the U. S. Geological Survey was the primary agency. 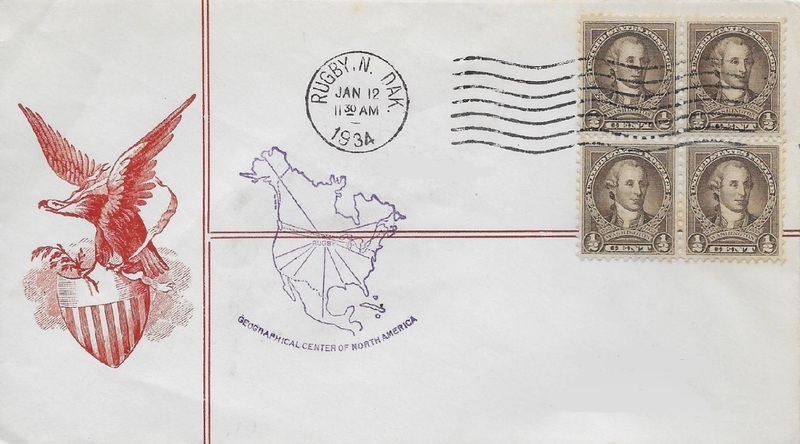 On January 20, 1930, a representative from South Dakota wrote to Douglas demanding a scientific answer. 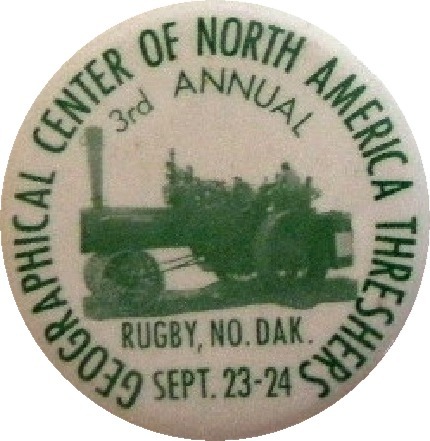 Douglas responded that it was impossible from any data available to determine the geographical center of North America because of the irregularities involved. 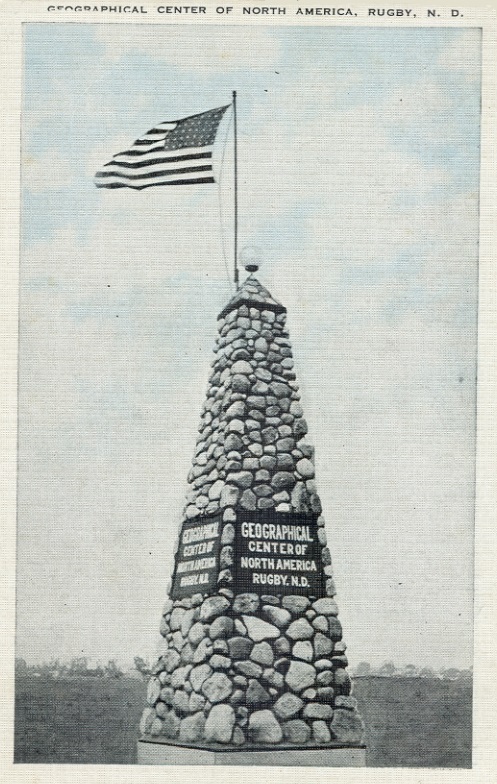 Douglas, who was probably the sole person to then organize a more concerted effort to make an official determination retired later that year and died in 1932. 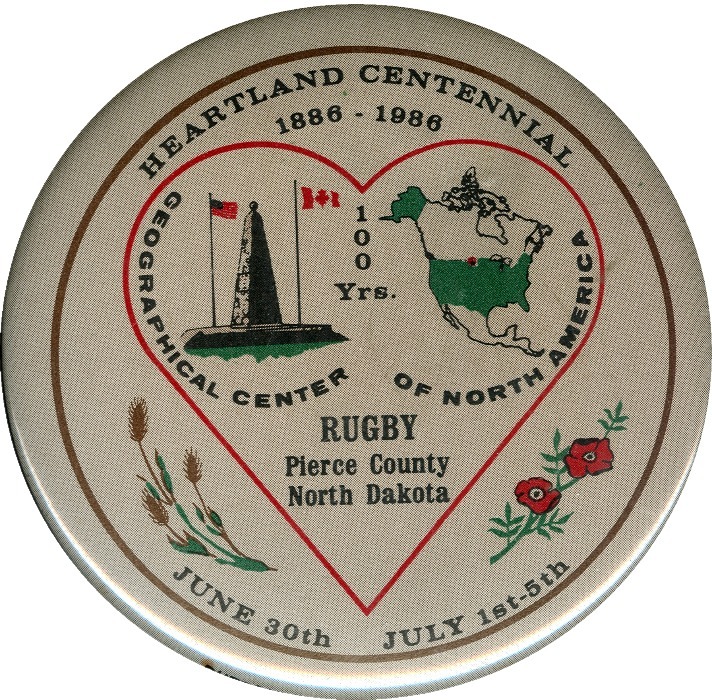 The location at Rugby has since been challenged numerous times by Pierre, but to no avail. 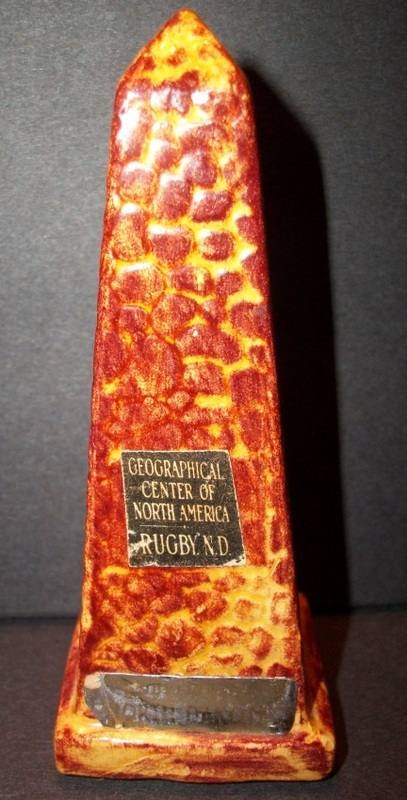 Threats of litigation had even developed when those at Rugby demanded that Pierre cease any mention that they were also at the geographical center. 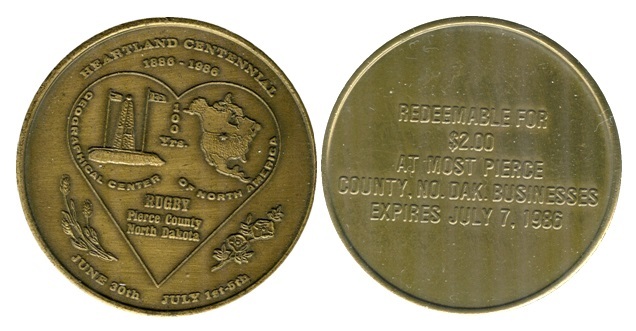 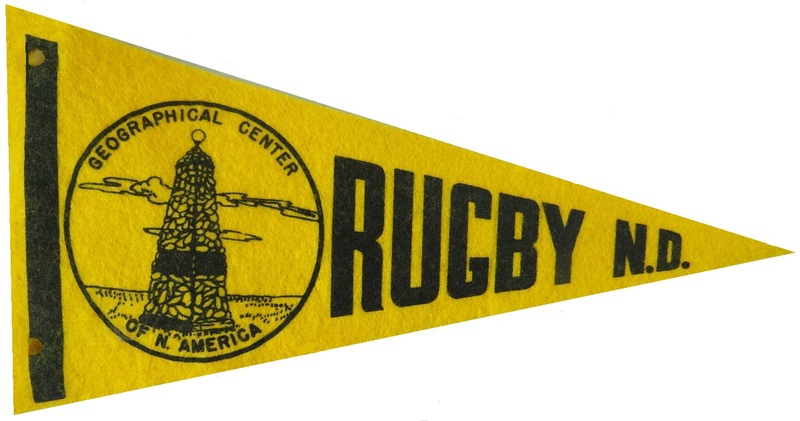 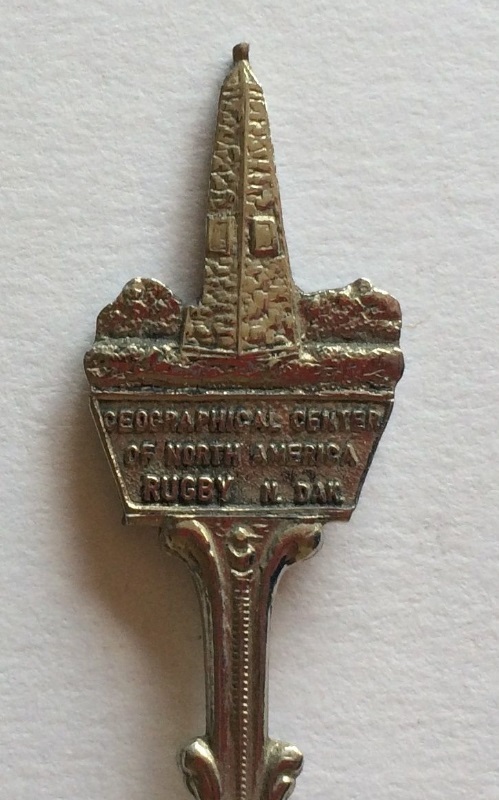 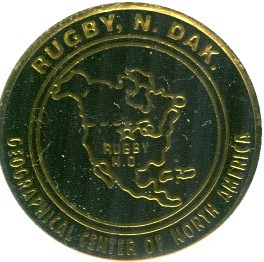 Rugby trademarked the phrase "Geographical Center of North America" in order that no other city would claim to be the coveted center location. 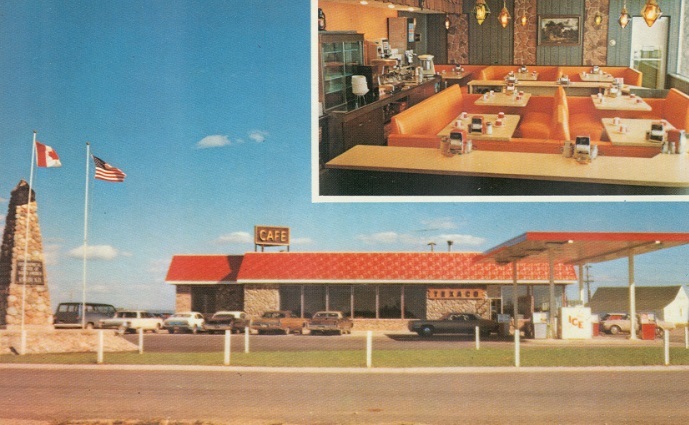 The battle with Pierre lasted well into the 1960's. 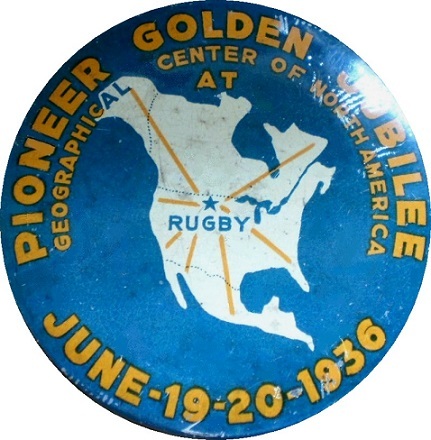 Regardless of the battle between the cities of Pierre and Rugby, there were two much smaller towns that lost out on the title. 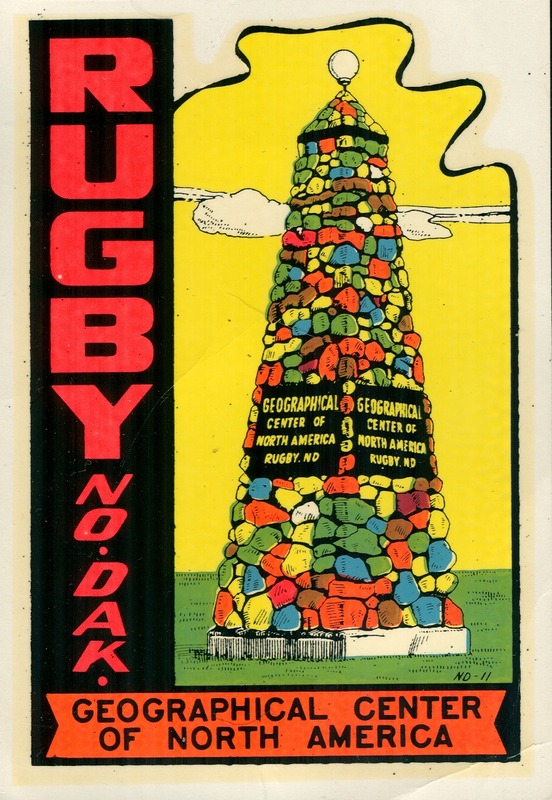 Douglas's determination of 48�'N 100�'W was actually 16 miles southwest of Rugby near the towns of Balta and Orrin. 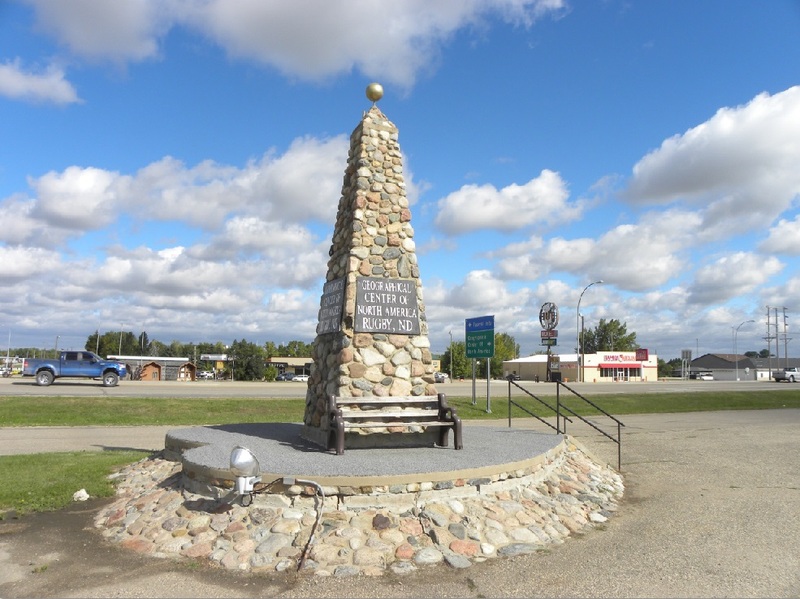 Balta is located 6 miles east of the exact location and Orrin is located 5 miles south. 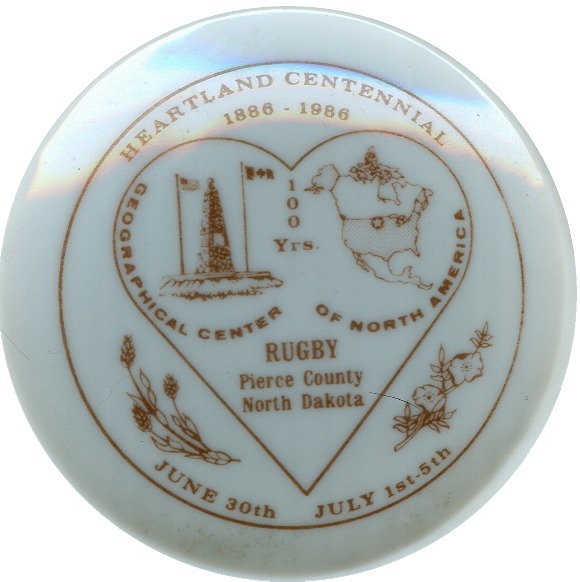 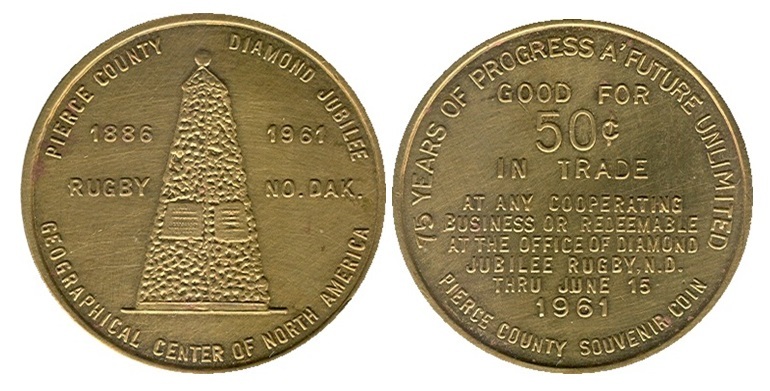 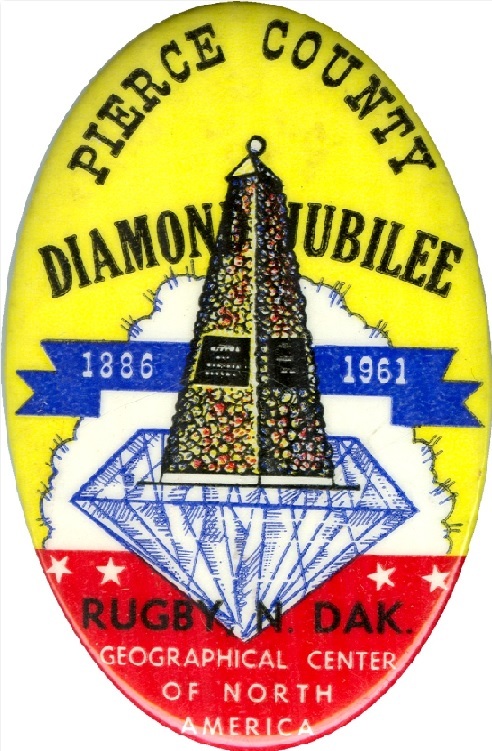 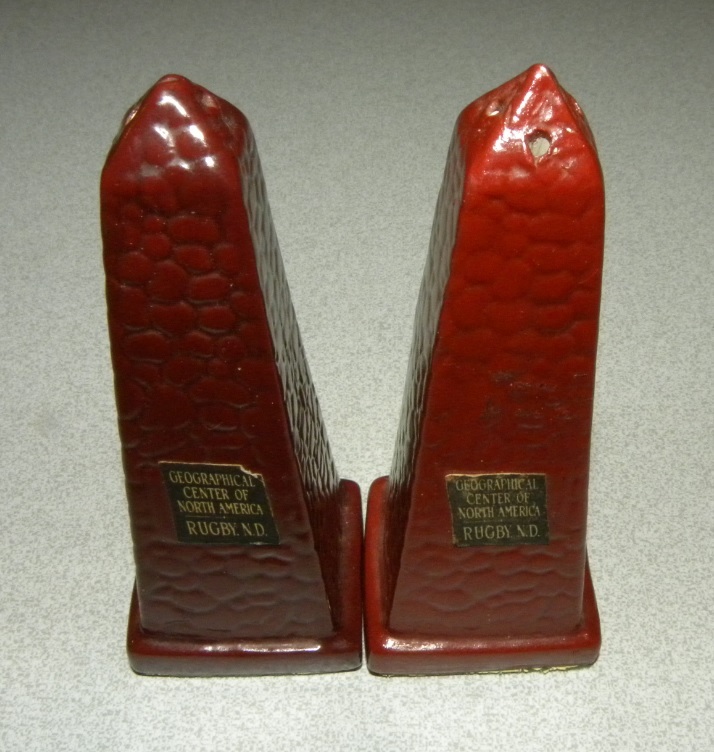 Since Rugby was the county seat of Pierce County, the promoters of that city thought a monument would be better served by being at the county seat so it was placed south of Rugby at the intersection of Highway 2 and Highway 3. 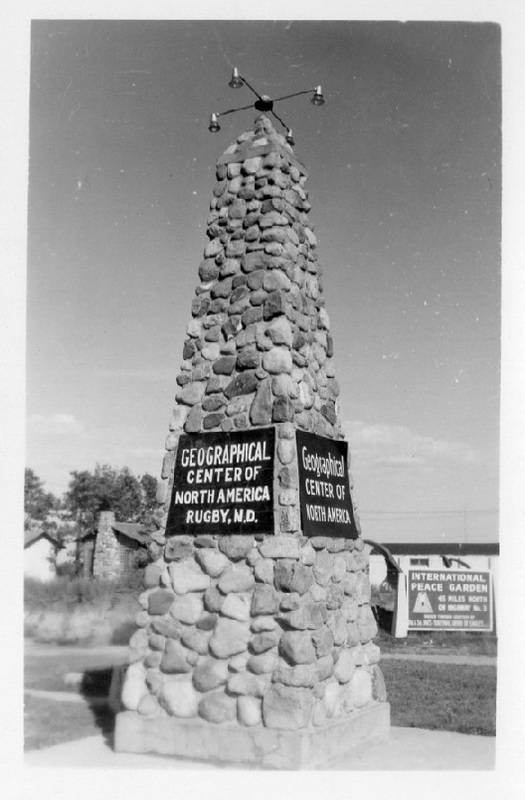 Originally the stone monument, completed in August 1932, was placed in the northwest area of the intersection. 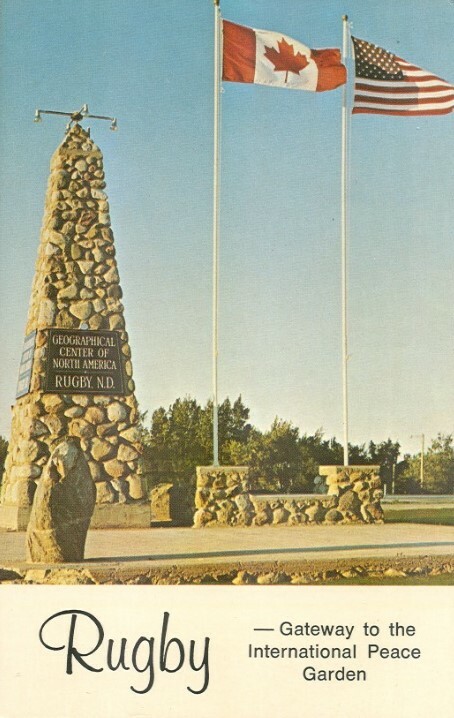 Road widening in 1971 caused the monument to be moved to a more suitable location to the southeast area of the intersection where it has remained since. 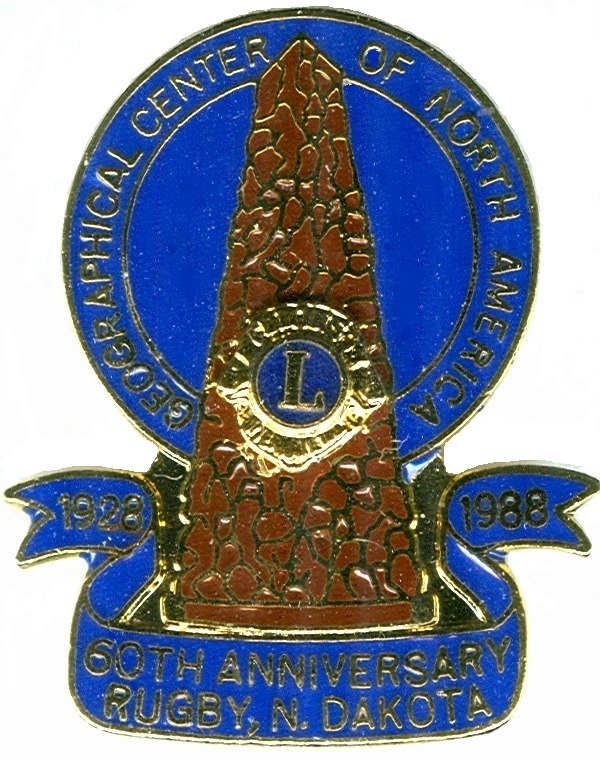 There are many factors that should have been involved when making the determination for the Geographical Center of North America. 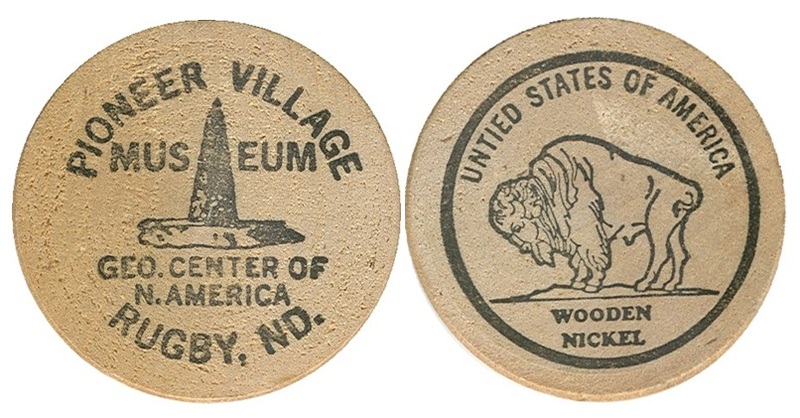 No one really knows what shape Edward M. Douglas had used for his cutout model of North America. 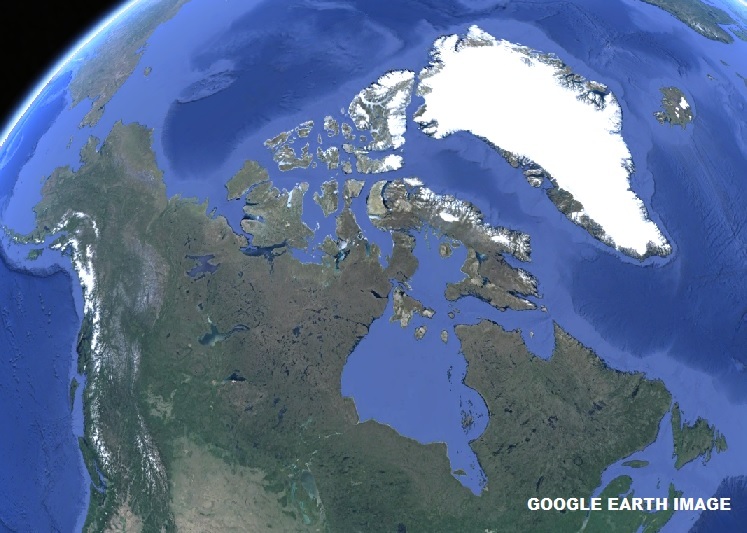 Due to the vast open water areas and the many islands in the Arctic Ocean region above Canada, there could be countless factors involved. 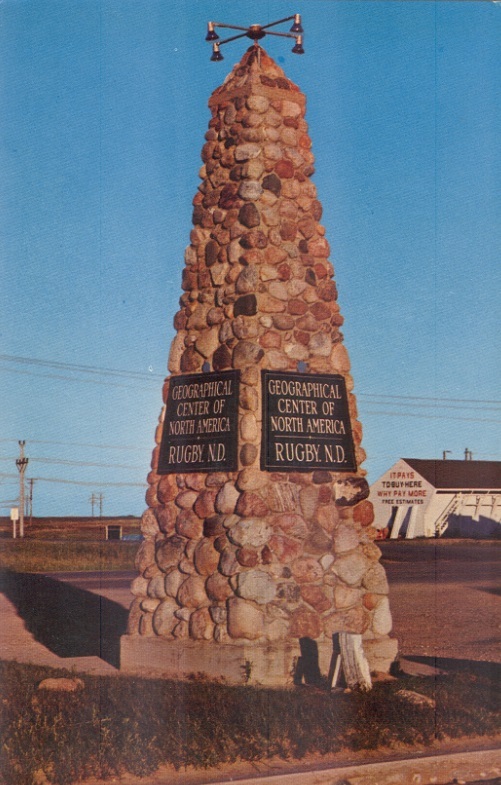 Did Douglas include Hudson Bay as a land mass? 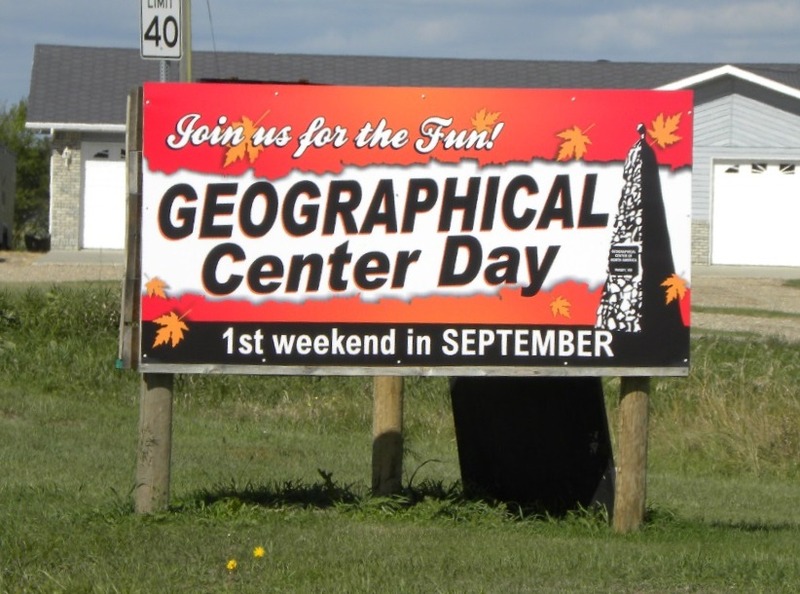 Did he include Greenland or Central America? 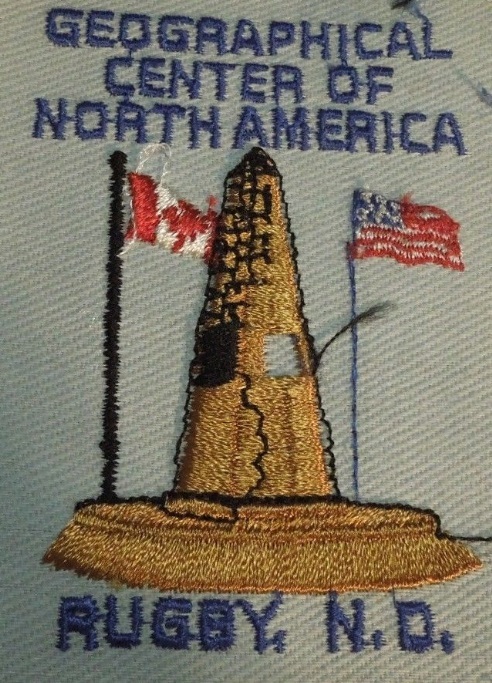 In reality, there could be thousands of different places that individuals could come up with when all using different models or land and water inclusions. 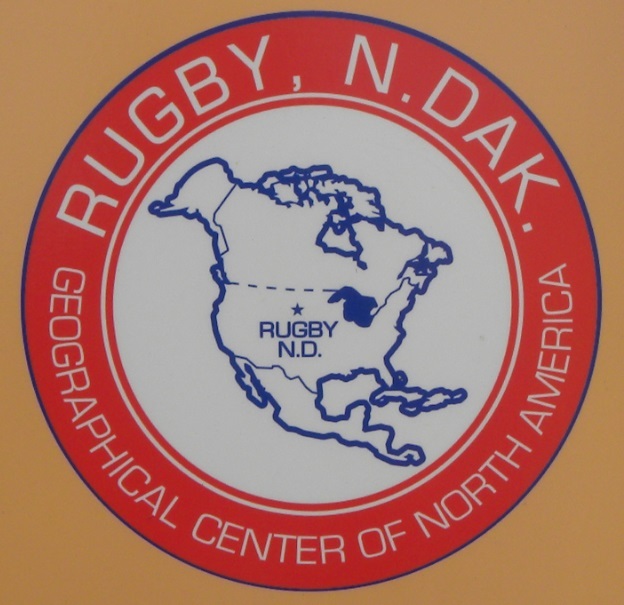 If a true challenge to the location at Rugby would ever be made, it would first have to involve the scientific community to agree upon what defines the outline of North America. 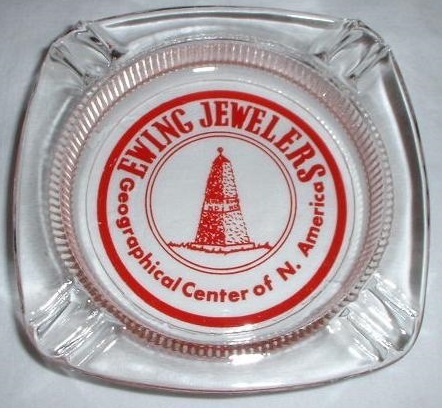 Whether water areas are included and if the rounded shaped of the earth is taken into affect instead of a flat surface map which is highly distorted to begin with would have to all be considered. 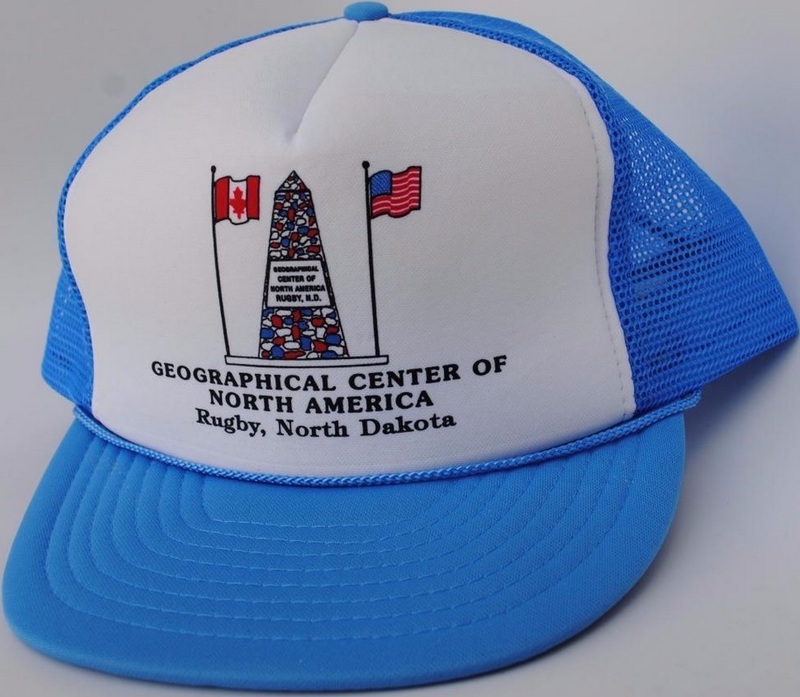 A new challenge has been made for the Geographical Center of North America. 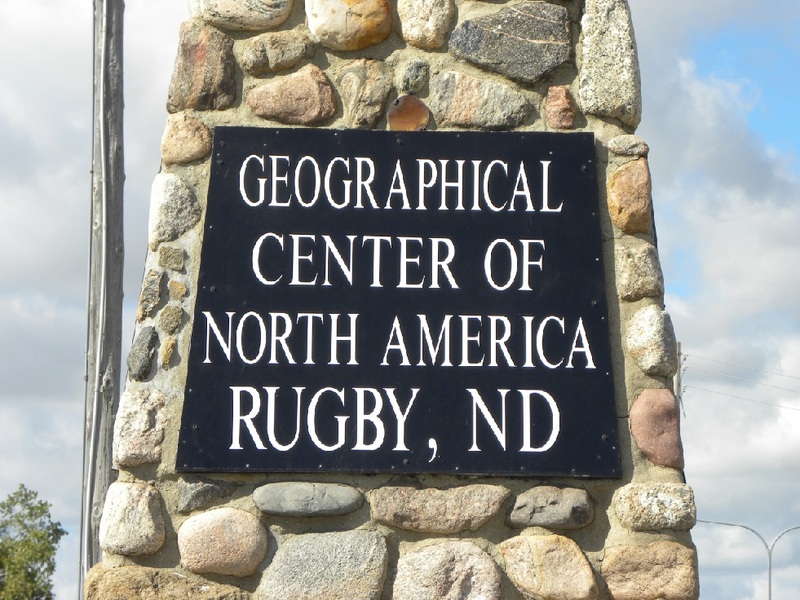 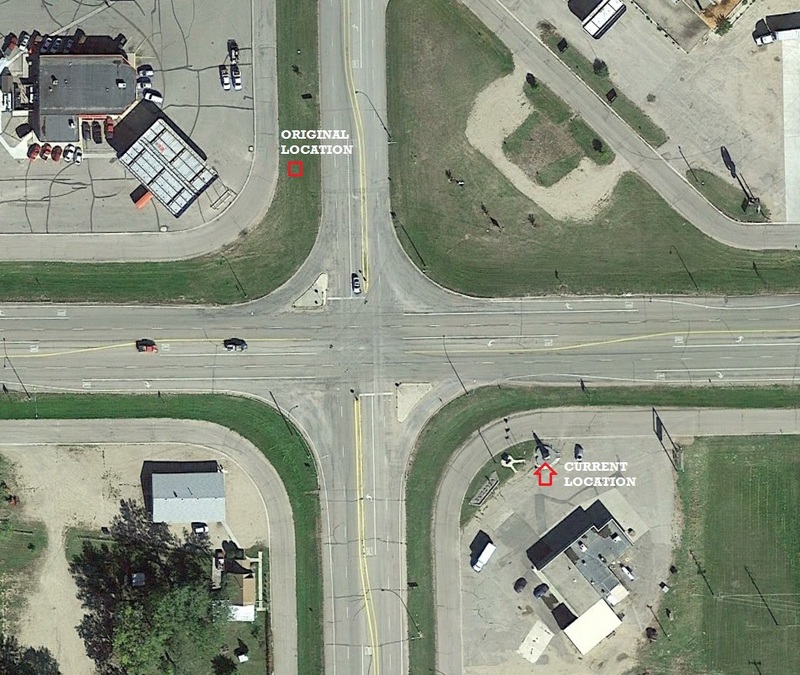 In August of 2016, Hanson's Bar in Robinson, North Dakota, was able to secure the trademark phrase "Geographical Center of North America" after the City of Rugby failed to renew is when it expired in 2009. 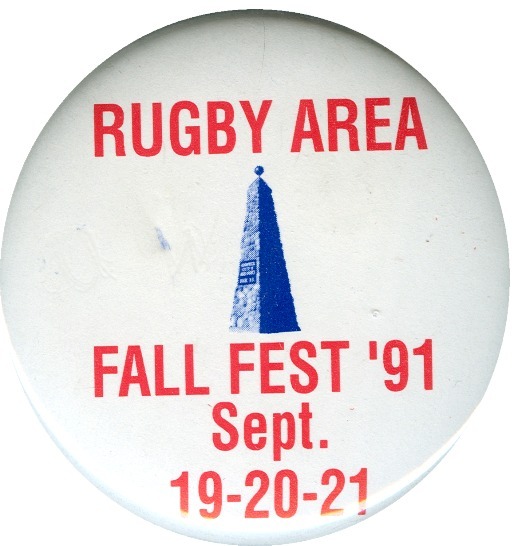 Perhaps it was the result of years of complacency or just perhaps a failure of newer city officials to realize what was at stake. 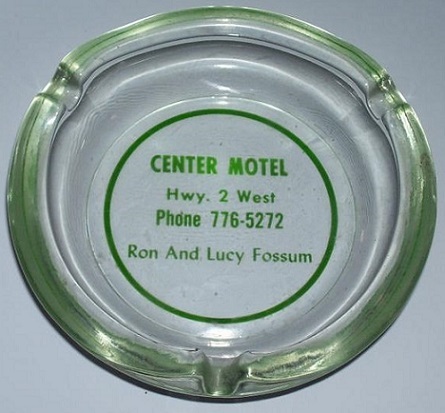 Those at Robinson had begun promoting their city for a full year dating back to the summer of 2015, so were able to verify to the U. S. Patent & Trademark Office that they name had been openly in use at their location. 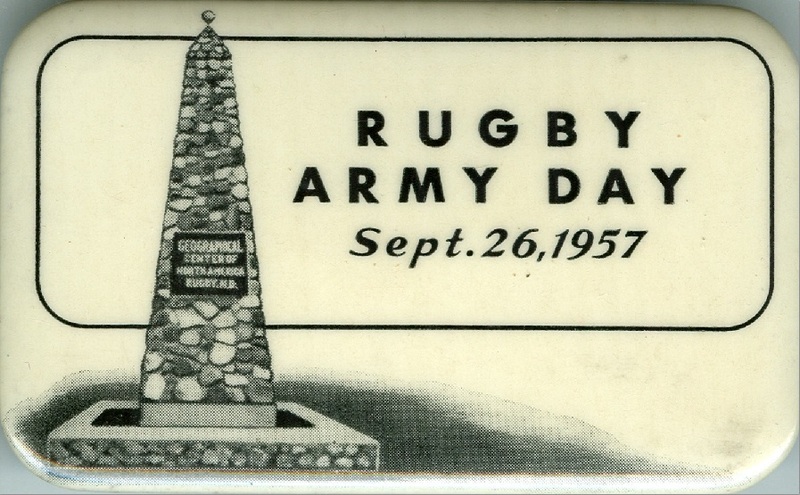 Large signs are placed in all four directions from Rugby at distances of 5 miles from the monument. 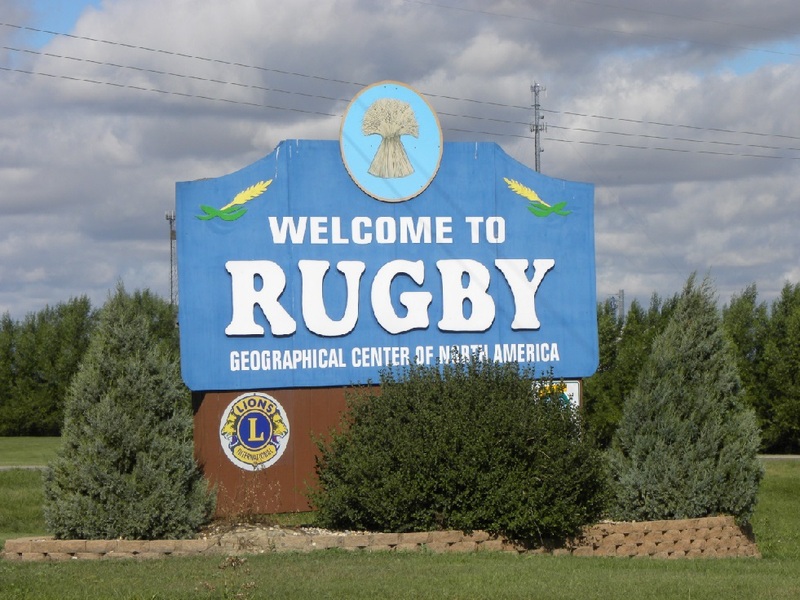 Sign entering Rugby from the east. 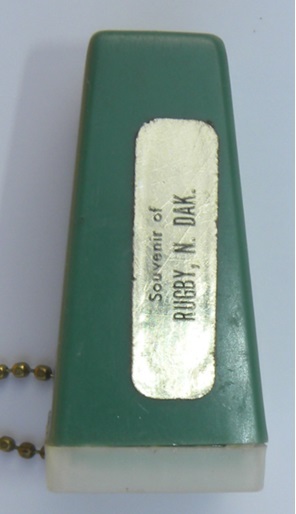 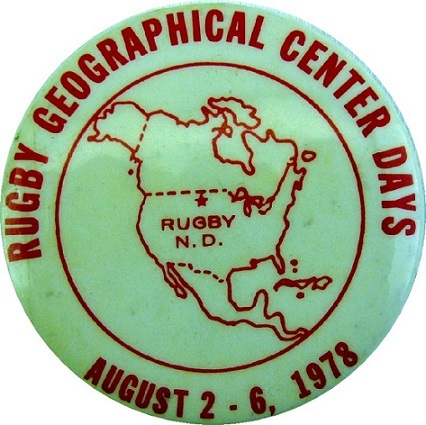 Geographical Center day is celebrated each September in Rugby. 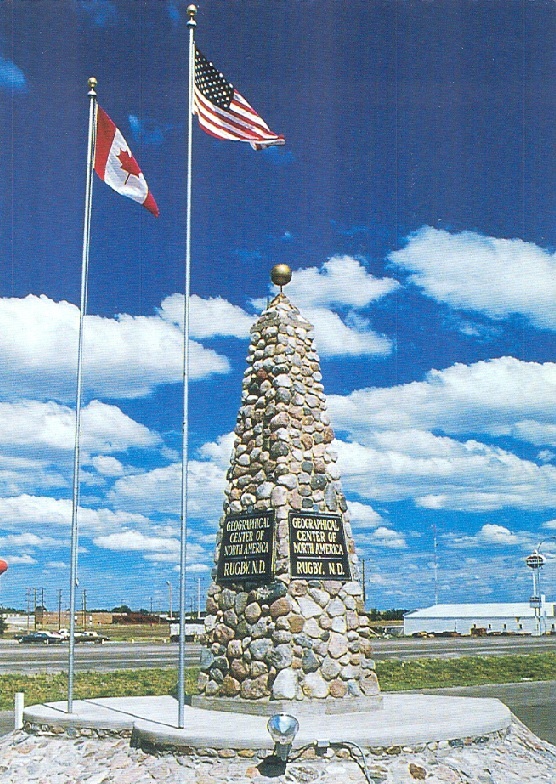 The monument as viewed from the southeast. 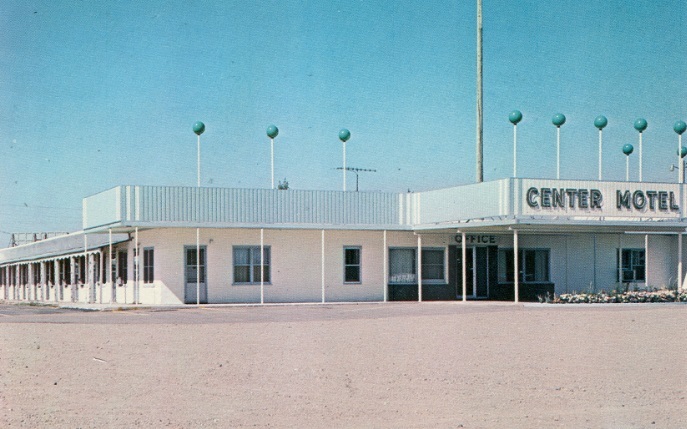 (Looking northwest). 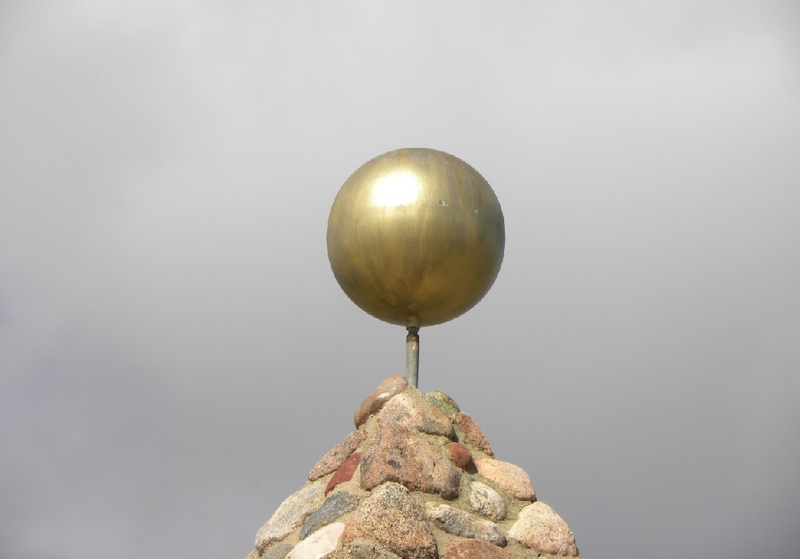 The top ball which is painted gold. 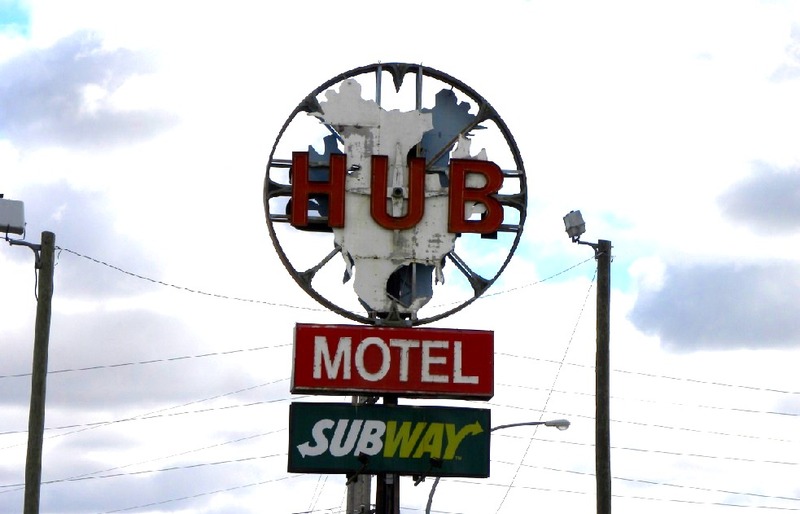 Lights were formerly on top. 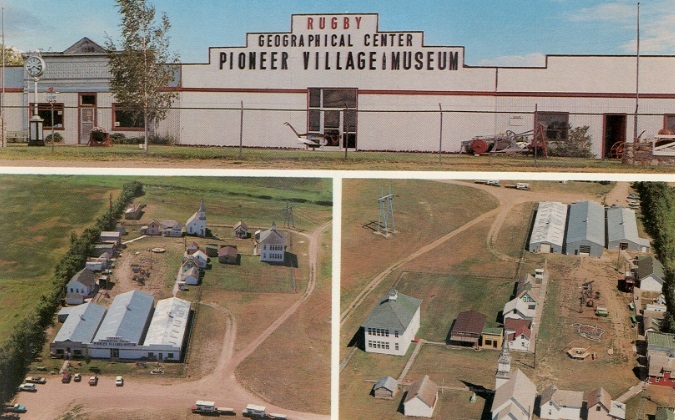 View from the southwest. 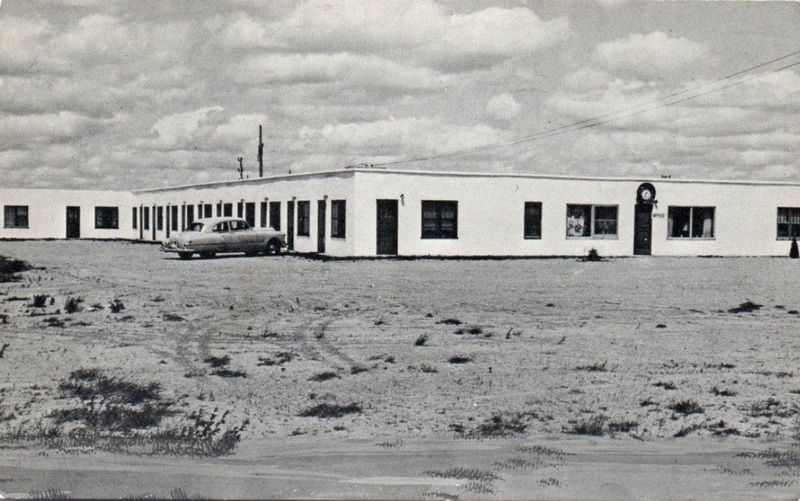 (Looking northeast). 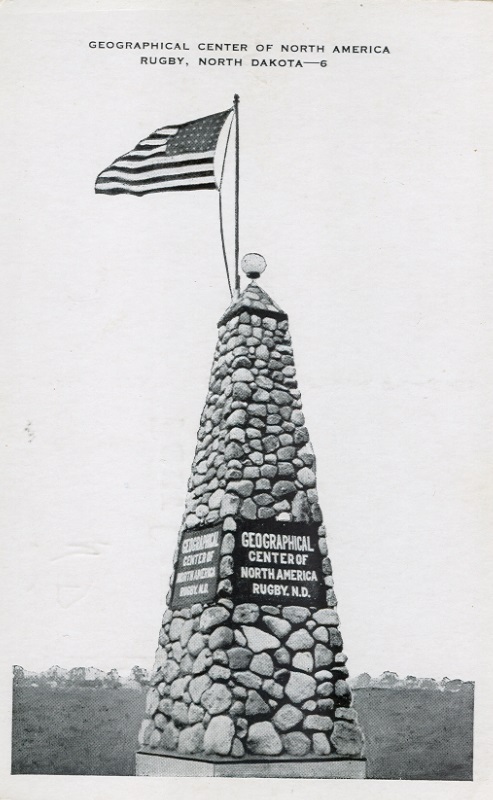 Note the heart-shaped platform on which the monument rests. 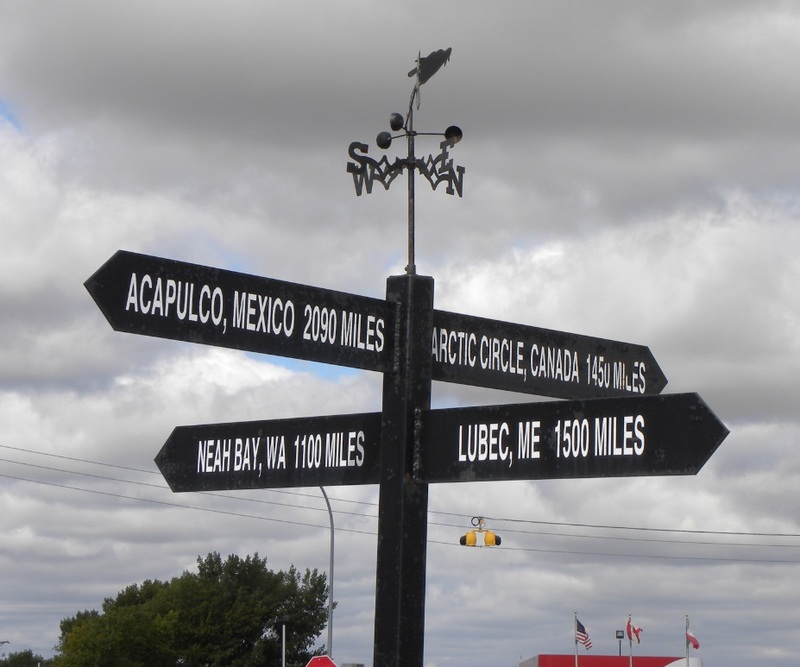 Sign showing distances to major North American cities. 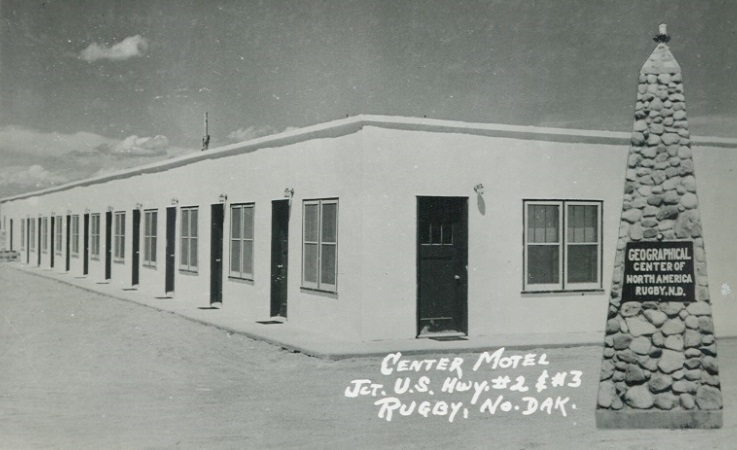 Hub Motel located across the highway to the north of the monument. 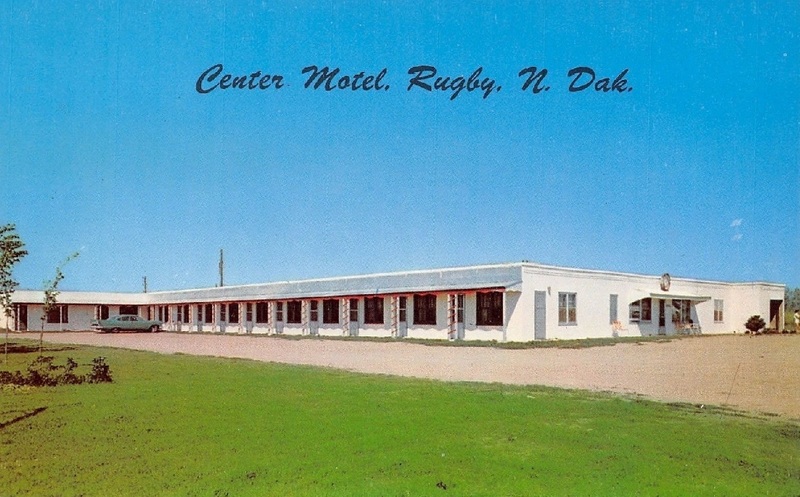 It was torn down in late 2015. 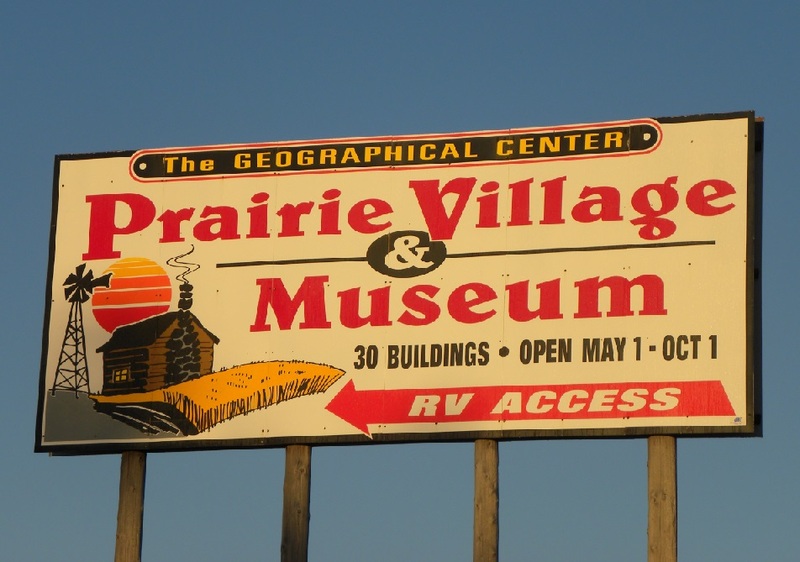 Sign advertising the Prairie Village Museum. 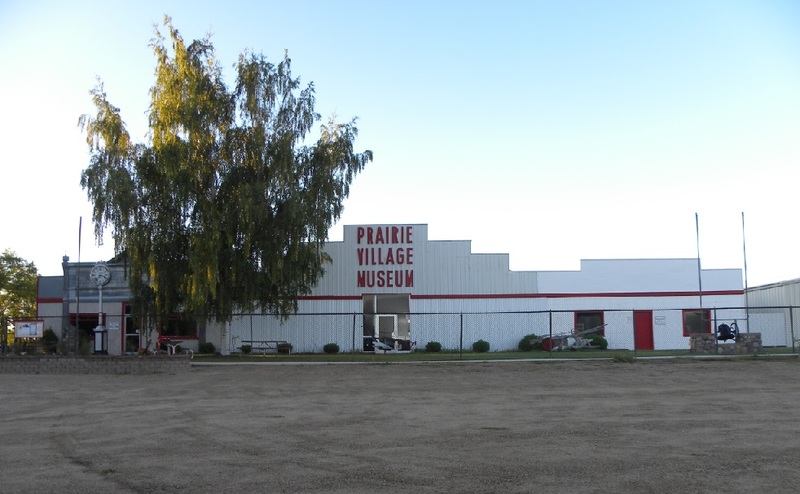 Front of the Prairie Village Museum. 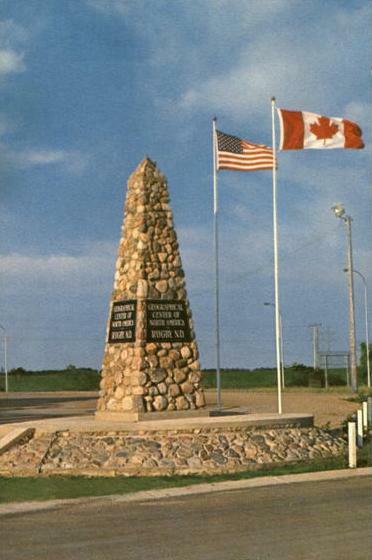 Located east of the monument. 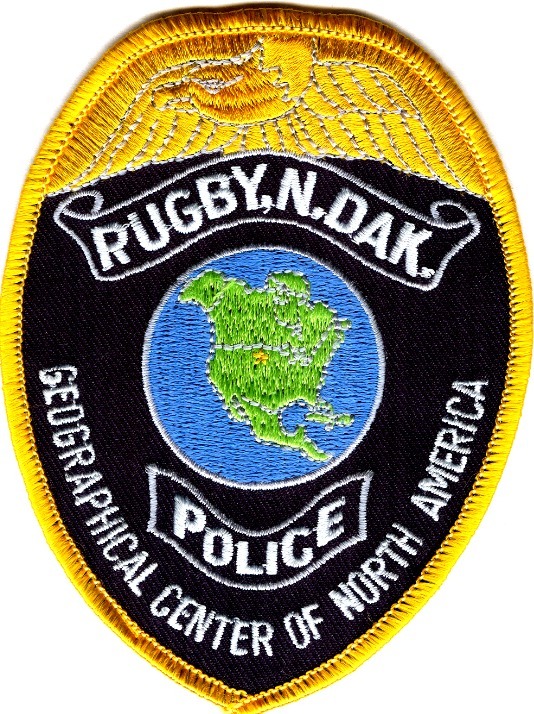 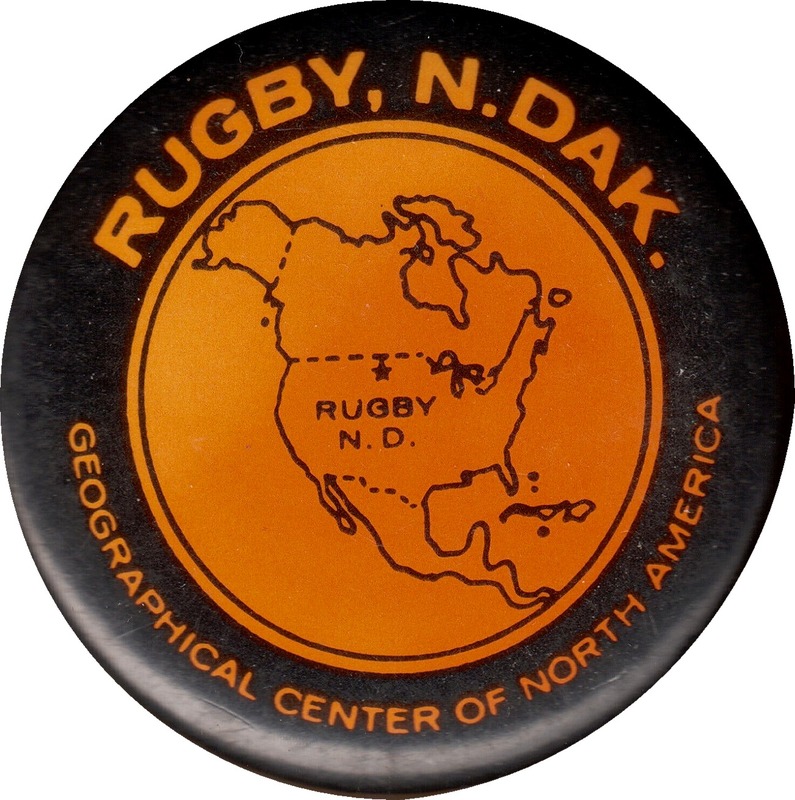 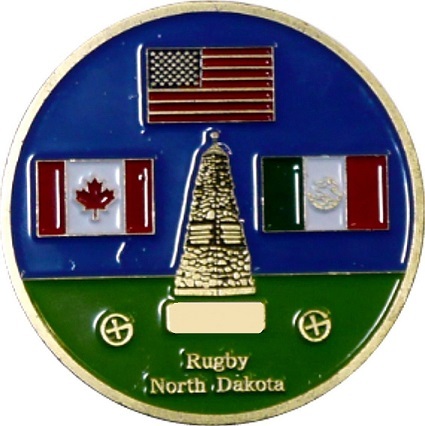 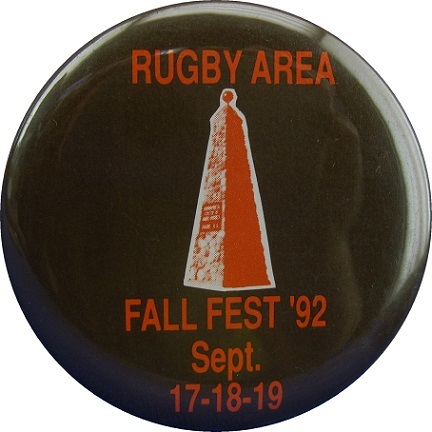 Official logo of Rugby promoting the Geographical Center of North America. 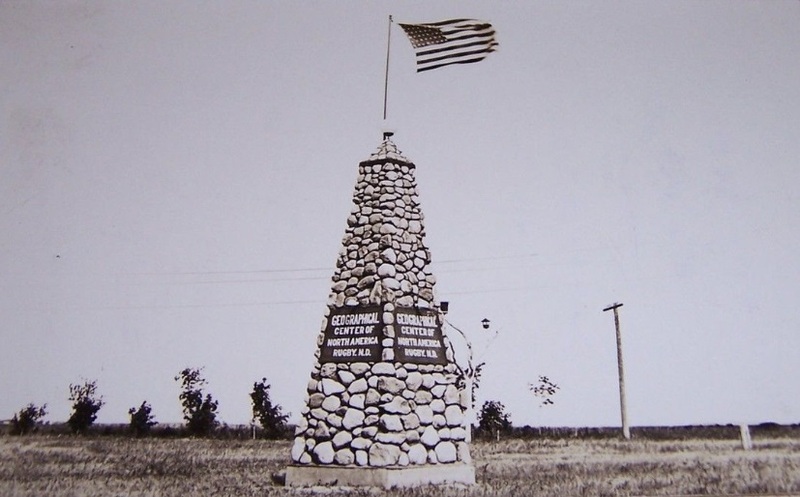 The original location of the monument was in the northwest corner of the intersection. 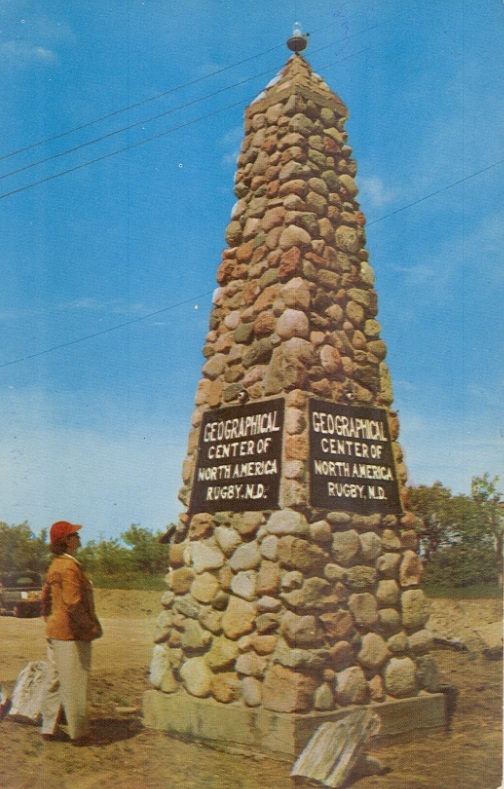 The monument was moved to the southeast corner in 1971 after road widening. 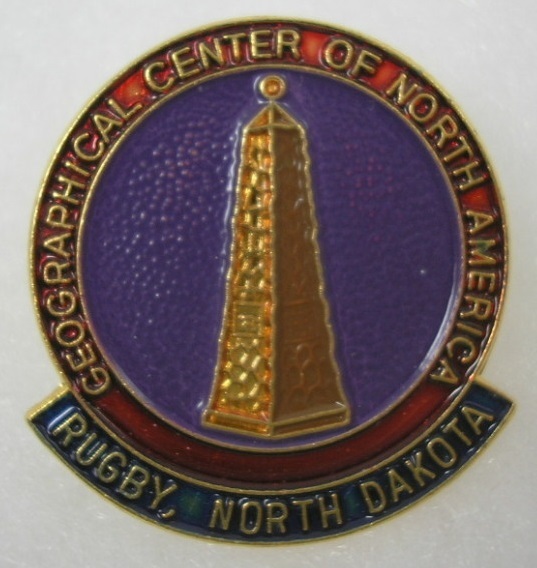 The true location of the Geographical Center is 16 miles southwest of Rugby and much closer to the towns of Balta or Orrin. 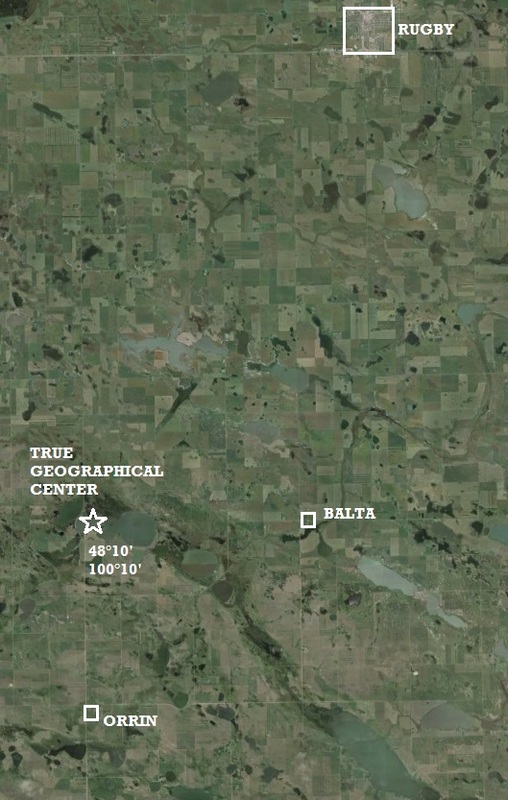 The true location as defined by the latitude/longitude position is 6 miles west of Balta. 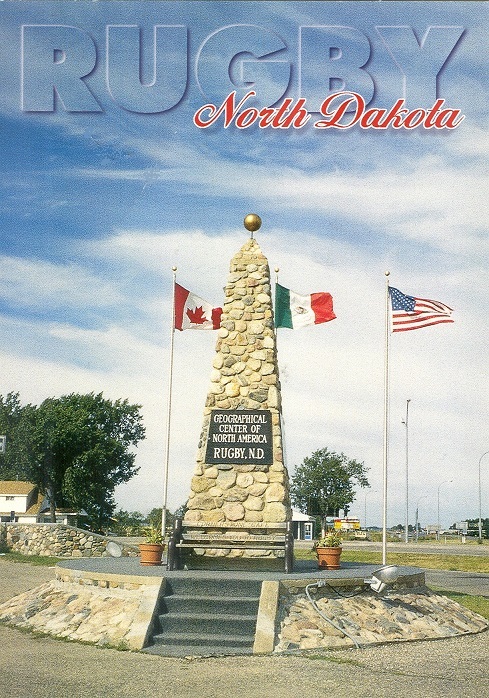 is what to include or not include in the northern regions of the continent.